Ultraviolet Hair Dye There are 25 products. For a hair colour that's as sweet as candy and twice as long lasting, look no further than the Manic Panic Amplified Semi-Permanent Hair Dye in Cotton Candy Pink! Liven up your look with a dash of fiery color with the help of the Manic Panic Dye Hard Temporary Hair Colour Styling Gel in Electric Lava! Onlookers will be glowing green with envy once they see you rocking this awesome shade of Stargazer Semi-Permanent Hair Dye in UV Green! Wearing the Stargazer Semi-Permanent Hair Dye in Red is literally going to have you glowing with style and alternative colour! Give your hair a shimmering glow with some Stargazer Semi-Permanent Hair Dye in UV Turquoise. There's no better way to get a great alternative look! Step out in style with the Manic Panic High Voltage Classic Cream Formula Colour Hair Dye in Cotton Candy Pink! Set your look aglow with this awesome shade of Manic Panic High Voltage Classic Cream Formula Colour Hair Dye in Electric Banana! Add a splash of perfect pink to your hairstyle with the Manic Panic High Voltage Classic Cream Formula Colour Hair Dye in Pretty Flamingo! Ensure you get that WOW effect with the loud and proud Manic Panic High Voltage Classic Cream Formula Colour Hair Dye in Hot Hot Pink! Unleash your inner party animal with some wild ultraviolet hair dye. By day you’ll be sporting a bright and funky color, but by night, your locks will literally be glowing with alternative style! However, if you’re also in the market for a one-off night out party accessory, we have plenty of hair gels and chalks to cater for your temporary hairstyle needs. All our ultraviolet hair dyes are reactive under UV and blacklight so you’ll be able to completely switch up your daily hairstyle to an outrageously awesome glowing ’do. This makes Manic Panic ultraviolet on bleached hair the perfect party look. With our expansive range of glowing hair dyes, it has never been easier to get a glowing hair color. 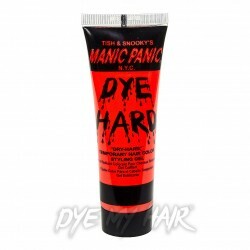 Both the iconic Manic Panic High Voltage and Amplified Ranges include daring UV colors and shades. 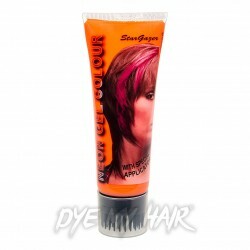 Here at Dye My Hair, we have plenty of semi-permanent UV dyes which are certain to give you an awesome radiant finish. The High Voltage range of colors offers vibrant and stronger shades such as ultraviolet red hair dye, whilst the Amplified range can last for up to 8 weeks for a longer style change. The Manic Panic ultraviolet faded look is also super stylish. These longer-lasting dyes are certainly for the seasoned partygoer or festival fanatic. When you pick Manic Panic UV hair dyes, you can choose from bold colors such as ultraviolet purple hair color, yellow or orange. Sporting brilliant hues such as these, you’re sure to be the centre of attention wherever you go! If you’re after a fun new UV hair dye then some dashes of Hot Hot Pink, Cotton Candy Cane and Pretty Flamingo are the certain ways release your inner rock chick. Manic Panic always caters for all and if you don’t believe us check out Manic Panic Ultra Violet review. The Manic Panic Dye Hard Temporary Hair Color Styling Gel range features electric bright colors such as Flamingo, Lava and Banana. These gels are the perfect one night only products. It’s simple to apply and even simpler to wash out, so it truly is easy and hassle-free. Much like Manic Panic, our Stargazer UV range offers options for both temporary and more permanent colors. The exciting range of Stargazer Semi-Permanent Hair Dye is perfect for those wanting to get the alternative look for longer. This jazzy collection of ultraviolet colors can last up to 6 weeks from one application. If you choose Stargazer dyes, you can choose from a variety of vibrant colors. As well as looking awesome, these products are less damaging to your hair. 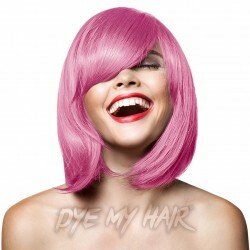 The dye is peroxide and ammonia free, so your hair will be kept strong and healthy while you prepare to dance the night away with ultra violet hair. For a temporary option, the Stargazer UV Hair Gel is simple to use and apply. If you’re planning a last-minute party or heading out for a rave then this is a totally temporary way round achieving that luminous look. Paired with glow sticks and luminous clothing you’re certain to look the part! Get the ultra violet without bleaching look and save the hassle of lightening your tresses. There are five awesome Stargazer colors to choose from, the only question that remains is which shade are you going to try out first? Our range of Paintglow products is perfect for those of your searching for a temporary hair color fix. If you’re preparing for a night out clubbing, or a one-off fancy dress party these UV hair products are the perfect costume accessory or add-on that you can use to stand out from the crowd. 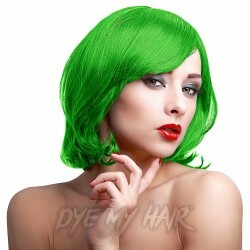 Complete any Halloween, fancy dress or Cosplay outfit with a dash of hair color. Paintglow UV Hair Streaks - there are plenty of different colors available in the Paintglow UV Hair Streaks range. This temporary hair gel can simply be applied to the hair with the wand applicator so you can use as little or as much as you like! The mascara-style hair colorer adds simple neon streaks that will easily wash out with a standard shampoo. Paintglow UV Hair Chalk – this simple neon hair chalk is the ideal way to add a whole new dimension to your favourite going-out look. Simply apply by rubbing into dampened hair, the chalk allows for a hassle-free yet highly effective way of achieving an ultraviolet hair color. Easy to wash out, it’s a product you can blend with others to create your own unique style. Embracing some alternative neon shades should be fun and expressive, so here are a few handy tips to make sure your UV experience all goes smoothly! Plan Your Color – If you have a dark natural color, make sure you research how well every color and duration is likely to show up on your hair. Some hair products need hair to be pre-lightened and we don’t want any party plans hampered by a dye that doesn’t show up! Always Have Extra – You don’t want to run out of UV goodness before you’ve managed to cover your whole head. Have plenty of dye/chalk/gel at the ready to make sure you have everything you need. Never Play It Safe – Embrace the true alternative vibes of UV hair. Mix, match and find a style that is totally unique to you! We think you are ready to embrace ultraviolet hair dye. 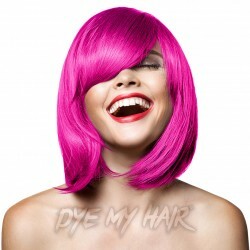 Here at Dye My Hair, we think the brighter and more unique your style the better! Dare to be different next time you want to change your hairstyle and enjoy a new glowing hairdo.